Do you have Snow Days where you live? We live in Wisconsin and usually there is at least one "snow day" each year where we get too much snow and are all snowed in. Schools close, Malls close, and if you're lucky - you get to stay home from work too! You literally can't get anywhere because it takes awhile for the snow plows to clean them up! I LOVE snow days - they are usually an unexpected day to stay in and watch movies or catch up on things at home - or just relax! I'm hoping to get one soon -- but so far it's just been COLD -- which means schools close but all the adults still have to go out! 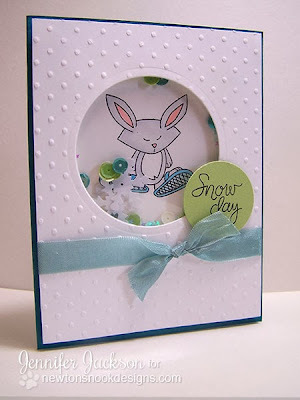 I think this bunny in snowshoes from the Snow Day stamp set is one of my favorite stamps right now —don't tell Newton! — but he's so much fun to color! I colored this bunny with copic markers, giving him bright teal shoes! Then I used him to make a fun little shaker card with some sequins, including a couple of snowflake-shaped ones. I used a teal card stock base and added some teal ribbon to coordinate with the sequin colors. I also added the "Snow Day" sentiment in a green circle to bring in a bit more green. If you haven't tried to make a shaker card yet, I posted a tutorial a while back on this post: Prehistoric Pals Shaker Card Tutorial - make sure to check it out. They're so fun to make! Adorable!! We have had plenty of snow days so far this year with all this snow--it's crazy. Love that shaker card---I hope I can learn from your tutorial! so so so so so cute!! LOVE thise sequins in the shaker part, too!! and the little bunny really is adorable!